Allied Impex Corporation, also known as AIC Photo, Inc and later Soligor, was an importer, distributor, and manufacturer of photographic equipment. 1956 advertisement in US Camera. Allied Impex Corporation was founded by Four German Jews who fled to America after the rise of Hitler and the Nazi Party. Victor and Ben Silverman were the owners. Bruno Multer handled Finances. The final original founder was Ralph Lowenstein, who was much younger than the other three men. Once the company began making money, a second entity, known as AIC Photo, Inc., was founded to act as the parent corporation with Allied Impex becoming the import/export company. The word "Impex" is believed to be a contraction of "Import Export". 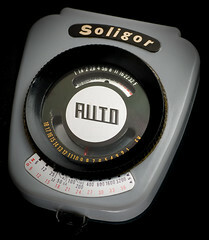 From 1956, AIC Photo, Inc. began using the brand name Soligor for cameras, lenses and accessories imported from Japan. It imported the Miranda cameras and later, using money acquired from taking AIC Photo public, took control of the Miranda company at some time in the 1960s. The company founded a German sub-company called A.I.C. Phototechnik GmbH in 1968, that became Soligor GmbH in 1993. This German company is the only one still active today (2009). It is known for its rich product range of camera accessories. Soligor distributed lenses in many different camera mounts, including nearly every 35mm SLR mount. 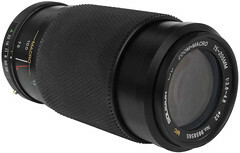 It competed with Vivitar, and both sold the T and T4 mount lenses with interchangeable mounts. Vivitar also sold TX mount lenses, but Soligor did not. 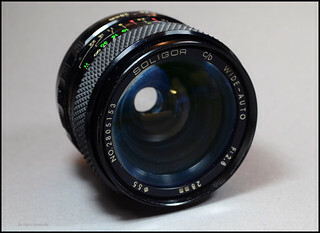 Soligor C/D lenses were intended to be higher-quality, much like Canon L lenses or Vivitar's Series 1 lenses. The C/D moniker is said to stand for either "Computer Designed" or "Compact Design" by collectors. Both designations are claimed to have been used in Soligor brochures but neither claim has been substantiated with a scan or photo showing the usage in print. 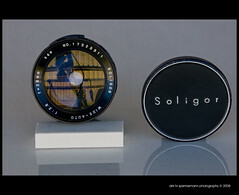 Soligor distributed a family of interchangeable mount lenses based on the T-4 system developed by Tokina in cooperation with Soligor and Vivitar. All the lenses in this line were manufactured by Tokina and are similar to the Vivitar T-4 family with the exception of minor cosmetic differences. Soligor sometimes changed manufacturers for the same make and model lens multiple times and did not always indicate the manufacturer through any easily discernible means such as the serial number. It's often difficult to know what company manufactured a given lens. However, lens enthusiasts at the MFlenses forum are working to reverse engineer any information available through the lens coding system used by Soligor. You can help by contributing your lens make, model, and serial number. ↑ Date: filing dated 1998 at Edgar Online. ↑ The FAQ of the Miranda Camera site says 1963, but the main page of the Miranda Society Japan says that it bought the shares in 1968 and took complete control in 1969. ↑ See this page of the Soligor GmbH official website (archived). ↑ It seems that in 1997, the company Allied Impex Corporation was an empty structure based in the USA, owning the German company Soligor GmbH and itself owned by AIC International, Inc., another empty structure. Source: filing dated 1998 at Edgar Online. This page was last edited on 7 December 2018, at 06:11.